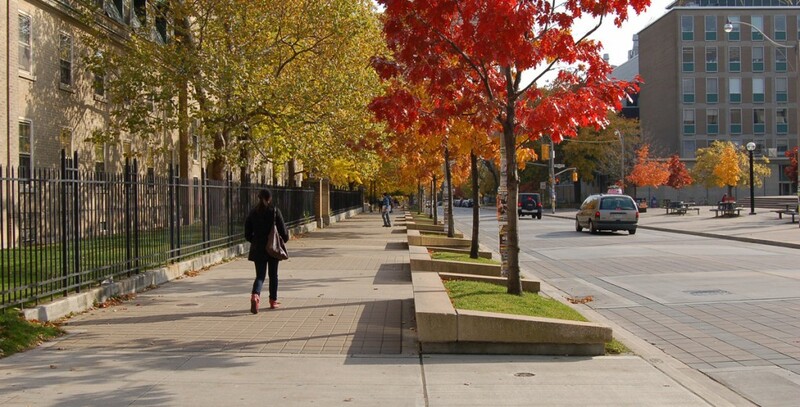 The revitalization of St. George Street, a main thoroughfare of the University of Toronto and a major traffic artery in the City of Toronto, was commissioned by the University and the City to bring improvements to what had once been a grand boulevard. 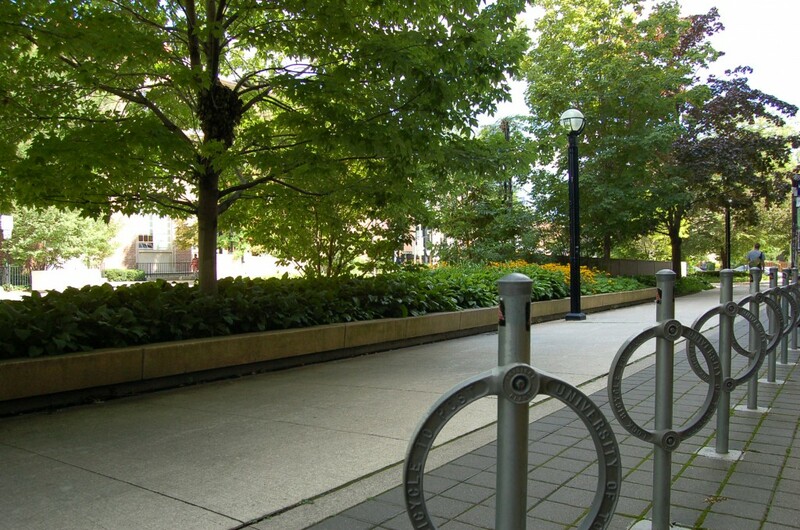 In close collaboration with the City of Toronto, the University of Toronto and various user groups, BROWN+STOREY worked structurally with the street’s many layers of visible and invisible infrastructure to secure the physical transformation of the street and a massively improved experience for all of its users. 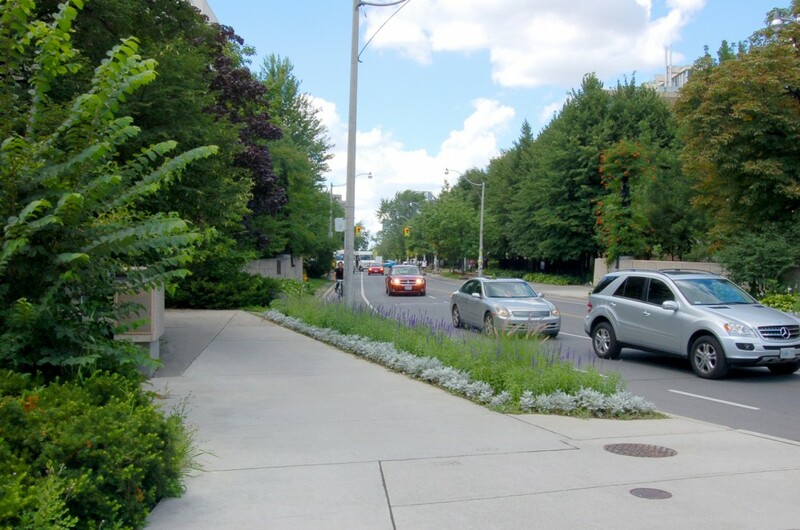 The first narrowing of a major street in Toronto, the revitalization of St. George Street raised the possibility of restoring a balance between the pedestrian and the car, created considered relationships between buildings and the public realm, and developed working solutions for the “greening” of city streets. 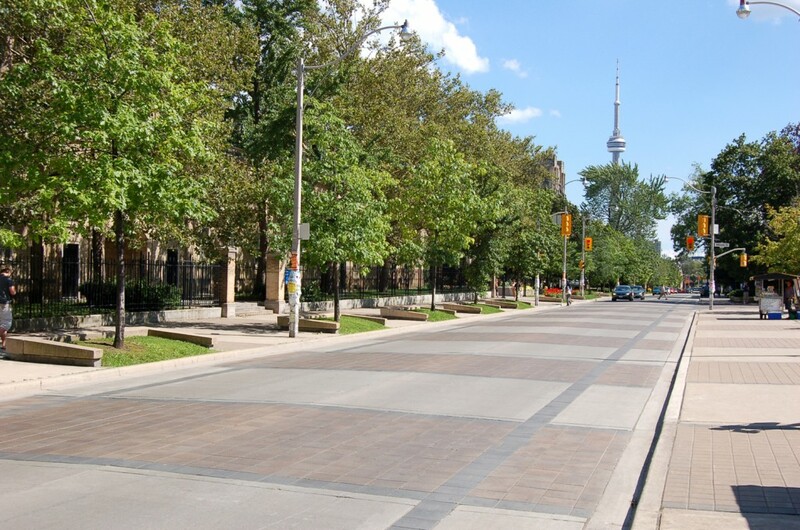 The project received an Award of Excellence at the 1997 Toronto Urban Design Awards. St. George Street was originally a stately boulevard lined with mansions. The elements that bound together the absolutes of the public street and the private mansion formed a fine grain pattern – a “string” – consisting of the carriage pavement, curb, grass verge with trees, sidewalk pavement, low stone wall, raised private lawn, a constant distance from the wall to entrance porch, to the subtleties of the interior spaces of the mansion, the foyer, reception, parlour, etc. This connecting string acted as a “grammar” of an urban infrastructure. As a single string, it connected the mansion to the public street within a sophisticated layering of physical and cultural languages. As a repetitive element, the strings then created a collective public landscape of the street. Two critical changes to the street threw this system completely out of balance: the widening of the street from two to four lanes in the 1940’s, which resulted in the elimination of the verge and tree canopy, and the acquisition by the University of Toronto of most of the mansion properties. The mansions were now quasi-public institutions, not residential, and the subsequent replacement of the mansions with much larger developments meant that the rhythm of buildings, their repetition and detail, were completely transformed to wide lot frontages accommodating buildings too large to consider the earlier “grammar” of the public and private realm relationship. 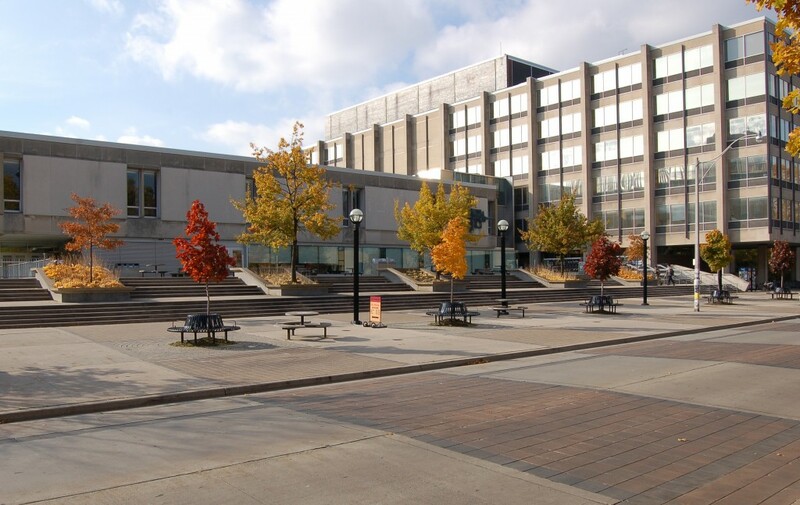 At a larger context, St. George Street was now part of a expanding campus and was seen as a dividing line between the more traditional east campus and the modern campus to the west largely built in the 1960’s. Any move to improve the situation of St. George Street in the 1990’s had to consider a new set of grammatical rules. The loss of the primary structural elements of the original street width and the lot structure required that a new relationship be designed. BROWN+STOREY created a new grammar for the public realm, building up new sets of connective links that tie each building into the boulevard, establish a collective relationship of the boulevard to the street, and extend the public realm of the street to the other open spaces of the larger campus grounds. 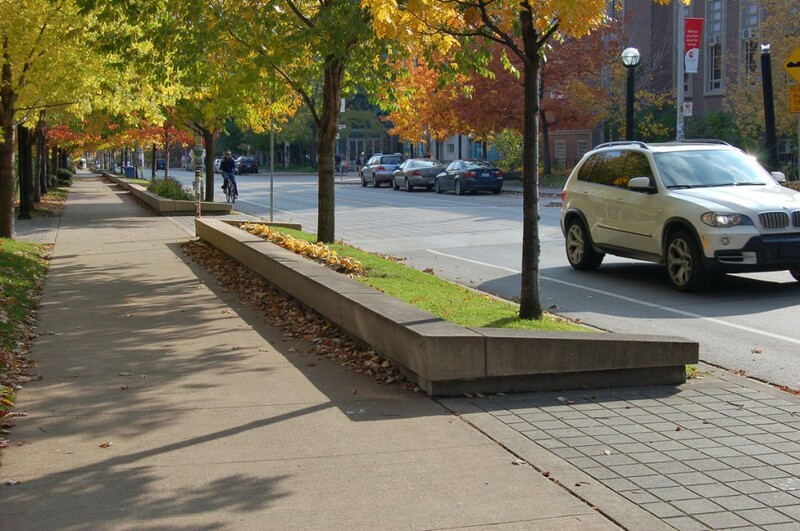 A close collaboration between the design team, the City of Toronto, the University of Toronto and various user groups resulted in significant changes to the street. The actual width of asphalt pavement for cars was narrowed while still accommodating existing traffic, a move that enabled the public realm to be expanded and redefined in its relationship to both traditional and modern buildings. 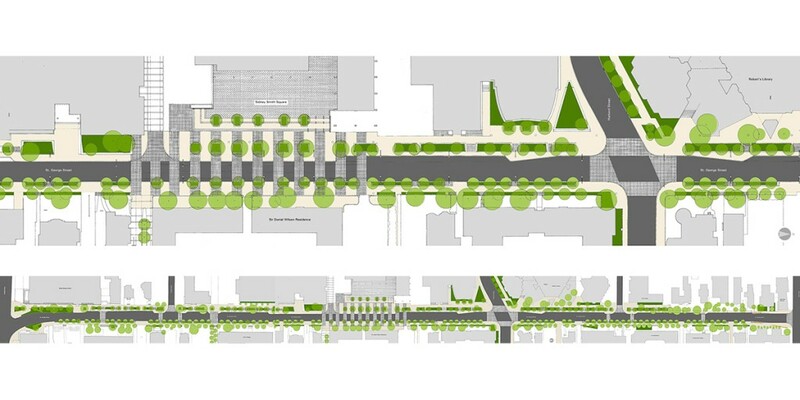 Generous new grass verges and boulevards ensure the vitality of three new rows of trees that line the entire length of the street and reinforce the existing pattern of trees. 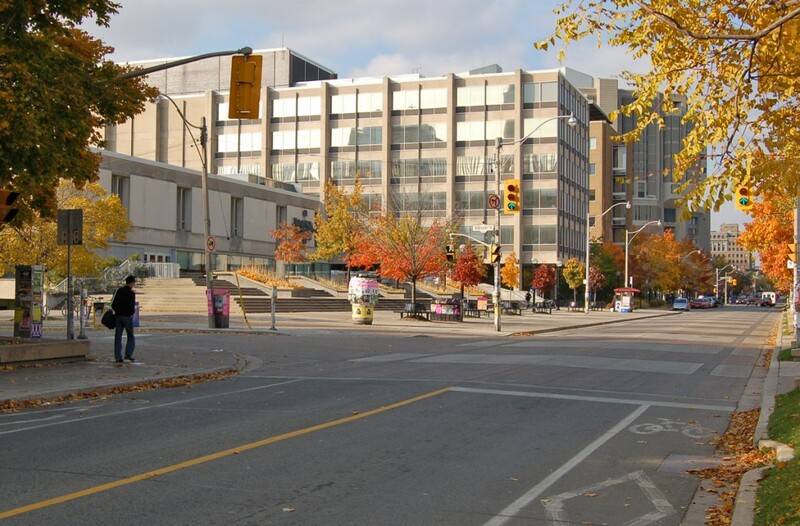 The success of the St. George revitalization was a crucial precedent for subsequent transformations of major avenues in Toronto: the Bloor Street transformation (between Avenue and Yonge), the reimagining of Queens Quay West and the planned overhaul of John Street all owe something to the pattern and success of St. George Street. A new relationship between the existing buildings and the expanded public realm was introduced through the different treatments of the east and west side of the street, which elaborated forecourts and created connections to the campus beyond. 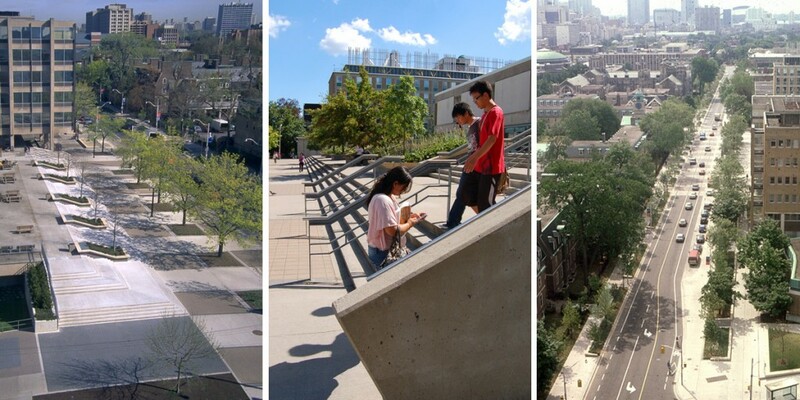 A new urban square at Sidney Smith Hall connected an unused podium plaza back to the street level, and now serves as a central focus of the street. Cross axes have been identified and elaborated to connect the main space of the street to its east and west systems of open spaces and courtyards. At its core, the revitalization of St. George Street was a challenge of urban design in the most complete sense: the balancing of many separate systems of infrastructure – traffic, pedestrian movement, underground services, lighting, plantings – with the social operations and characteristics of the boulevard – its evolution, its building typology and transformations, the careful delineation of public and private realms of open space. 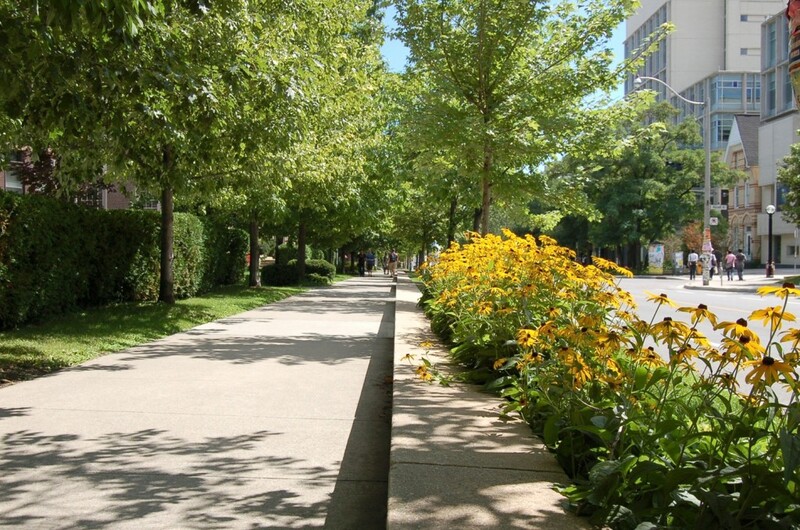 Transforming St. George required careful insertions that engage those layers, and created a powerful new precedent for the reconsideration of Toronto’s most well-used public space – the street. BROWN+STOREY designed an awarded entry for the 1995 St. George Street Ideas Competition, and were subsequently awarded the commission for the revitalization project in joint venture with van Nostrand Di Castri Architects.